The ASUCR Senate held their fourth meeting of the winter quarter last Wednesday, Feb. 8 at 6:30 p.m.
During public forum, Rich Davis, representative for the Science, Technology, Engineering and Mathematics (STEM) high school committee for UCR stepped up to the podium to discuss future plans for UCR’s STEM high school. He previously spoke about the matter in Nov. 2018, where he was “extremely impressed” by student turnout at community meetings for discussion of the school. Davis agreed that there is still “time for discussion” but countered Wilcox’s statement that no site had been selected: “A site has been decided upon, after the university proposed four possible locations,” Davis said. He then went on to list said locations and why three of them were denied. The first proposed location was around Box Springs, which Davis says was denied because faculty parked there and did not want to lose the area. The second proposed site was around Martin Luther King Blvd., which was rejected because it was “too far away for high school students to walk to” and also because the nearby fields were being sprayed with pesticides. The third site was located on Blaine St. and Canyon Crest Dr., where the baseball fields are. That site was rejected because “depending on who you talk to” it was too far for students to walk to and was too close to college student dorms, which was considered an unsafe choice. The fourth and accepted site proposal is the intramural fields around Glen Mor. 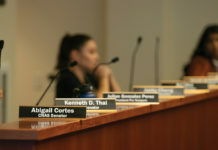 Davis was “perplexed” because he and his group have “held two public meetings that many UCR students attended and spoke at” which were intended to make plans for the school clear, as well as a board meeting that discussed the topic as well. 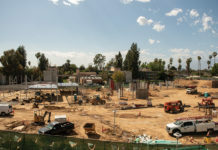 He also noted that the environmental impact of putting the school on the fourth proposal site is still being looked at for approval: “the district is still marching down that road to build the school there,” Davis said. Another concern Davis voiced on behalf of the surrounding community is that there is currently no parking for either the projected 1,200 students attending the school or the staff that will run it. “So where are the students going to park? In the neighborhoods,” Davis pointed out. “There’s been talk about bussing kids in, but then there’s the problem of more pollution and traffic in the area,” he added. 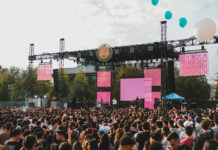 “Students have expressed concerns about having high school kids on campus; they’ve also taken away that to remanage the fields, things will be paid for by student funds,” Davis later said. “We’ve been told the university will find another place to put the fields but I’ve yet to find out where the new fields will be, or who’s going to pay for it. We appreciate the continued interest in the project, as well as its support and opposition. We look forward to continuing working with you all,” he concluded. The meeting adjourned at 7:15 p.m. The next meeting will take place Wednesday, Feb. 15 at 6:30 p.m. in HUB 265.